I picked up the book after meeting the author, Heidi Schulz, at a gathering and hearing her talk. She completely bowled me over with her sunny charm. She is from Oregon and she home-schools her daughter. I instantly liked her. And the more she talked about the book and the story behind the book, I got curious and decided right then to pick it up and read it, just to see if the book is as charming as the author. And it is! With the introduction saying, "Children Have Sticky Fingers and Ask Impertinent Questions," followed by the first chapter titled, "In Which Our Heroine Displays a Clear Need for Professional Help," I knew I was in for a riot of a good time. But still, I didn't raise my hopes up too much. I didn't want to go in with high expectations and feel let down. But I needn't have feared. An old salt of a curmudgeonly narrator unfolds the tale of young Jocelyn, the sole living progeny of the infamous Captain Hook. Yes, the very same Captain Hook, with Peter Pan and the gang. Jocelyn's mother is no more, and she is the ward of her maternal grandfather, who wants to forget the fact that there ever was a vile man named Captain Hook who had anything to do with his family. Moreover, the law of the land dictates that only a male offspring can inherit the family fortune, so, despite his wealth, the grandfather cannot do much for Jocelyn in terms of financial security. However, Jocelyn has other plans. 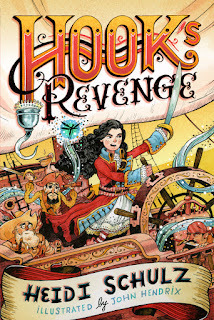 She wants to follow in her father's footsteps and become the most fearsome pirate captain ever. The girl romanticizes sailing the seas and plundering and pillaging, once she joins her father. But, with no word from him, and days rolling into months, she is left with no choice but to accede to her grandfather's decree and enroll in Miss Eliza Crumb-Biddlecomb's Finishing School for Young Ladies. That, as her grandfather points out, is Jocelyn's only hope of acquiring a suitable life partner who can support her when he himself has to shuffle off the mortal coil. Life is full of disappointments. Chocolates melt or are eaten by rodents. Ponies die. Kittens grow into cats-- and cats are such hateful creatures. However, when Jocelyn arrived at the place that her grandfather intended to be her home, school, and prison for years to come, she was not disappointed: it was just as terrible as the girl had expected. She faces the usual spiteful rich-and-spoilt peers at the school, and while Miss Eliza is fair and resourceful, she is also a strict disciplinarian who will tolerate no nonsense. No exceptions. However, Jocelyn makes a new friend, Roger, a kitchen assistant, and life seems a bit more bearable, even if terribly stifling all the same. We'll leave our heroine there, no spoilers. She does go on an adventure, she does manage to experience what she had been longing for all her life. But did it turn out the way she had dreamed? The writing is cheeky, playful, clever, witty, and utterly delicious. I read this aloud to my ten year old. She immediately picked up on phrases like 'sinus spelunking' (after asking for explanations). "I am sorry for coming in late," Jocelyn said to the boy, "but I was lost in the best part of my book. A giant Cyclops threatened to eat Odysseus and his crew. In order to escape and return to their ship, they had to get the monster drunk, wait until he was firmly asleep, find a sharp stick, and" -- Jocelyn leaned in and spoke in a reverential whisper --"gouge his terrible Cyclops eye out. Isn't that marvelous?" Ambrose yawned. He did not bother to remove his finger from his nostril, choosing instead to speak around it. "This is rather disgusting talk for the dining table." His sinus spelunking paused for the briefest of moments while he looked Jocelyn over. Although the style of writing is saucy and deliberate, the ten year old enjoyed the read-aloud sessions. She might not have picked it up on her own and stuck with it. But, the more I read aloud to her, the more she got into it. And that is the strength of this book. Aside from cantankerous narrator regaling us in his snarky voice, the story progresses with care-- things happen, Jocelyn gets caught up in them, and discovers things about herself that she would have sworn was not possible. The week before Jocelyn's grandfather decided to send her away to finishing school was an eventful one, even by her standards. On Monday, the girl's newest tutor found his pupil unable to do her history lesson. Someone had torn most of the pages from her lesson book in order to make paper boats. This same unidentified person had then floated the paper vessels on the garden pond, after lighting them on fire, of course. Jocelyn sat at her desk, the very picture of wide-eyed innocence-- with a spot of soot on her nose and the faint smell of smoke still clinging to her rumpled dress. Before I end up quoting the whole book here, let me wrap up by mentioning that this is an absolutely delightful, riotously adorable, glorious debut novel by a super-talented writer. The story could use some intensity and urgency, the supporting characters could use some oomph, the quest could use some girth and purpose, but Jocelyn is every bit the spunky, spontaneous heroine with endearing flaws which makes her grow on us over the course of the journey. There are books that I read for the gripping story, books that I read for the possibilities, books I read for the absurdity, books that I read for the poignant heartbreak, and then there are books I read for the sheer pleasure of the language. This book is in that last category. The U.K. version of this book is called Hook's Daughter, and Heidi Schulz reads a bit of it aloud in this video. There is a sequel, of course, The Pirate Code, and I hope it lives up to its older sibling!